“Snus” is the Swedish word for snuff, but the Swedish product, with a tradition of over 200 years, is quite different from the nasal snuff found in Europe and South Africa. It is a moist, oral tobacco product sold loose or in portions, made from finely-ground, air-dried tobaccos carefully selected from various parts of the world, mixed with water, salt, sodium carbonate and flavourings. In Sweden, the production of Snus is regulated by the Swedish Food Act, so all processes and any additives are approved for use in food, and the manufacturing process is subject to strict regulations. The production technique includes the use of heat and steam to cure the tobacco – a pasteurisation process. The relatively low temperature keeps the TSNAs low (Tobacco Specific Nitrosamines, which are potentially carcinogenic). Read about Lancet’s article on Snus. Swedish Snus is also different from the US Snus which is fire-cured, and from “chewing” or “dipping” tobacco – no chewing or spitting. The portion, or sachet, of Snus is placed under the upper lip, and that’s it. For you – no inhaling, no chewing, no spitting. For those around you – no smoke. The nicotine is absorbed through the mucous membrane of the mouth and kicks in almost immediately. For some people this generates a tingling sensation. Because of this natural absorption process, Snus is sometimes referred to as “Nature’s own nicotine gum”. When you have finished (or even halfway) the sachet can be placed in the special, sealable cavity in the lid of every Jakobssons can. Snus portions are ideal for those times when smoking is not allowed – having morning tea with a friend, to go with your after dinner coffee, or in fact with any drink that goes with the flavour of the Snus you are using. Going on a long trip (car, flying, motorbike??) - take Snus with you and relax. Going to your favourite Restaurant - take Snus with you and sit anywhere. It's raining in the outside smoking area – keep warm and dry inside with Snus. Snuff dates way back to Columbus’s second voyage to the Americas, when a monk in the party noticed the local priests inhaling tobacco powder through a reed. The idea of snuff was introduced to Europe in the 16th Century and became popular with the French Court after Jean Nicot suggested it to the French Queen Catherine de Medici as a migraine remedy – and it worked. The use of nasal snuff became fashionable in all the courts of Europe. In Sweden in the 1700s tobacco was grown in order to make snuff. Farmers ground snuff for their personal use. The French Revolution put an end in fashionable Europe to the use of nasal snuff, which was largely replaced by cigars, but mainly replaced in Sweden by a pinch of moist snuff (snus) placed under the upper lip. This use of snus became so popular amongst the Swedes that factories were developed to ensure sufficient production. In the early 1900s the Swedish Government introduced a pension scheme, and needed money to fund it. They also needed money for the Defence Force as WWI started. In 1915 they nationalised the previously private tobacco industry. The tobacco monopoly lasted until the 1960s when American cigarettes became popular amongst the upper classes; snus was relegated to the rural and lower income population, and demand slumped. The production of snus was almost discontinued. Then the restrictions on cigarette smoking started to come into force and in Sweden snus again became the accepted way to use tobacco, spurred on by the introduction of Snus portion packs in the 1970s. Instead of having to pinch together loose snus to form a shape suitable to slip under the top lip, one could just open a can, take out a portion (like a tiny tea bag) and discreetly pop it into place. The use and acceptance of Snus is spreading worldwide, and we are pleased to say we have developed an association with the Swedish Jakobssons family who have been making Snus, off and on, for over 200 years.Henrik Jakobsson is the fourth generation in the business. The producing company is Gotlandssnus AB situated on the island of Gotland, off the Baltic Sea coast of Sweden about halfway between Sweden and Latvia. Visby, a World Heritage, former Viking, site is the only town, but there are several large, and many small, villages. Because it is regulated by the Swedish Food Act, the production is subject to extremely high standards. Thanks to a long working relationship with a leading researcher, and an expert in the production of Snus, Jakobssons Snus has a particularly low level of TSNAs. Gotland Snus has its own laboratory and development centre, and because of its relatively small size is very flexible and able to follow the latest trends and tastes in Snus production. At present we have 2 blends: Wintergreen and Melon. The packing is in plastic cans with 20 x 1g portions. – for finished, or half-used, portions. Watchpoint: Although we are told that Jakobssons Snus need not be refrigerated, beware of the effect on moist tobacco of heat such as lights or our hot summers – keep it cool!! 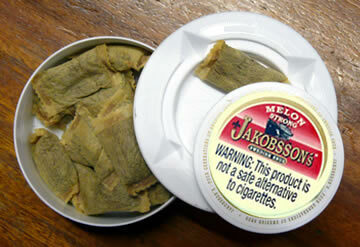 Jakobssons Snus will soon be available at a tobacconist near you. It’s raining in the outside smoking area – keep warm and dry inside with Snus.